There is nothing as good as a holiday away for renewing and refreshing body and mind. Long road trips and visiting other parts of the country just the ticket for appreciating how much beauty can be found in this country we call Godzone. But it is an equally lovely, yet different, feeling walking in the front door after a holiday and knowing you have just entered 'home sweet home'. I saw the first signs of flowering on our pohutukawa the day we left on holiday, and was sure we would miss it in all its glory. And holidaying inland in Hamilton as we did for most of the holiday, there wasn't a pohutukawa in sight. I have to say I missed seeing them. But, it turns out, our tree was determined to save its best for us. This was our glorious welcome home on Monday. 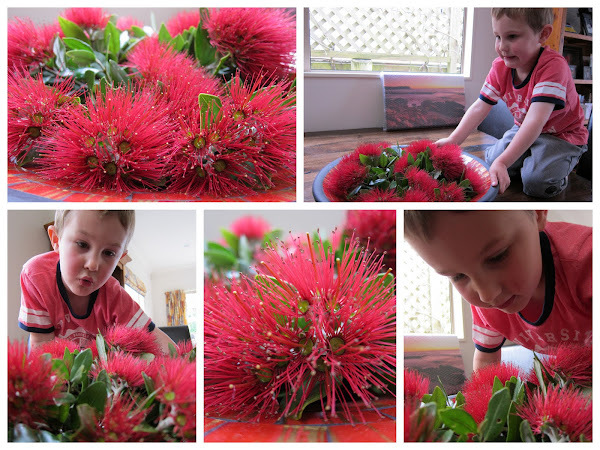 Noah even asked if we could pick some pohutukawa telling me it would go nicely in our big red mosaic bowl in the middle of the dining table. Was I going to turn down an opportunity to enjoy its beauty inside as well as out - not likely! It's also unusual for us not to go back to work straight after New Years, I think this is the first year we've had an extended break, due in part to my work closing down right through till the 10th. But it has given us just the excuse to have a few extra days at home. Opportunities to catch up with friends and new babies. A playdate with a friend for Noah. Enjoying new toys acquired. The Kung Fu Panda blow-up boxing bag was a big hit with us all. I'll even admit to throwing a few punches on my way past. 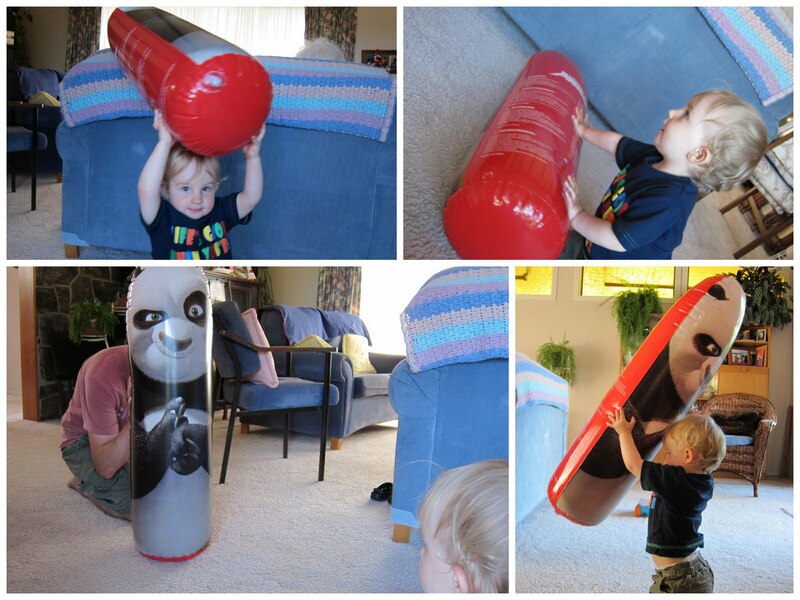 You fill the bottom with sand or water and punch, karate chop or kick to your heart's content. He just keeps coming back for more! 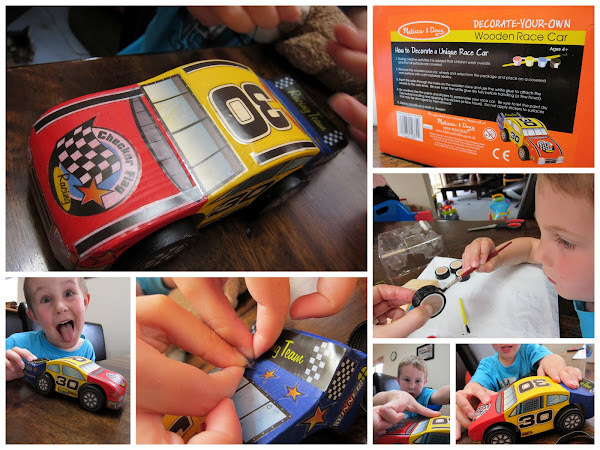 Noah and I had fun creating and decorating this cool wooden car. Then there was the more mundane. Rooms to be tidied. An annual spring clean of the cupboards and drawers about the place. Readying the spare room for the arrival of our special English visitors in three weeks' time. A bathroom needing to be painted. And while Mark is not entirely pleased about having to do this whilst 'on holiday', we'd agreed ages ago it would be the perfect opportunity as the bathroom has dried out nicely not being used for 2 weeks, and we can use the downstairs one in the meantime. Some waterblasting to be done - although I think we've decided to put this one off till next weekend. No point going back to work knackered and in need of another holiday now is there! Crunchy peas, juicy raspberries and wineberries and a few good-sized courgettes just begging to be eaten from the garden. BBQ's to be had. Mind you, Mark got more than he bargained for when he went to put the BBQ cover back on and this wee friend tickled his hand. Nearly as big as his hand too! 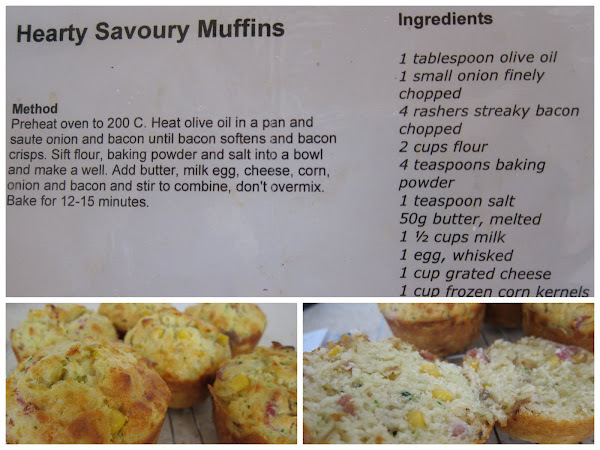 A bit of home baking for lunch -it was the least I could do to feed the hungry painter working in 30-40 degree temperatures up in our bathroom - the joys of a windowless, airless, skylighted room. On the upside, at least he'll work off any extra Christmas weight in sweat over the next few days! There were some squeals of delight from me when THIS arrived in the post. Loving that it did. My giveaway win from Kelle Hampton's blog Enjoying the Small Things at http://www.kellehampton.com/ a few weeks back. I love the fact I have something unique that possibly no-one else in NZ does. Although you should check out the OnMySide at http://www.onmysidebrand.com/ website as the brand and designs are pretty funky and would make a great and unique gift whether for you or someone else. I wasn't paid to say that either! Today we got fifteen month and four-year old injections out of the way. Done together - were we cunning or what! One very brave four year old who did not let out a peep. And happily gobbled up the jelly beans on offer afterward. One very UN-impressed fifteen month old who howled and wriggled and howled some more! Funny given that their usual pain tolerance threshold is the opposite. Noah usually cries as if the world is ending when he gets hurt, while Mylo is usually hard as nails with even the biggest knock or fall. Their capacity to keep us on our toes by doing the unexpected is one aspect of parenthood that never fails to amaze me. As much as I LOVED the holiday we had away and I could always stay on 'just a few more days', I am fully content to be home. Appreciating all that our home, sweet home is. And just to end, I'm linking up to Sarah at Catching the Magic's Lyrical Sunday http://www.catchingthemagic.com/2011/01/lyrical-sunday-week-2-holiday/ with these creative words on the Holiday Theme. Welcome home! A lovely post to read with the most beautiful pohutukawa blossoms and photographs. I love your new top; which looks stunning on your trim figure! 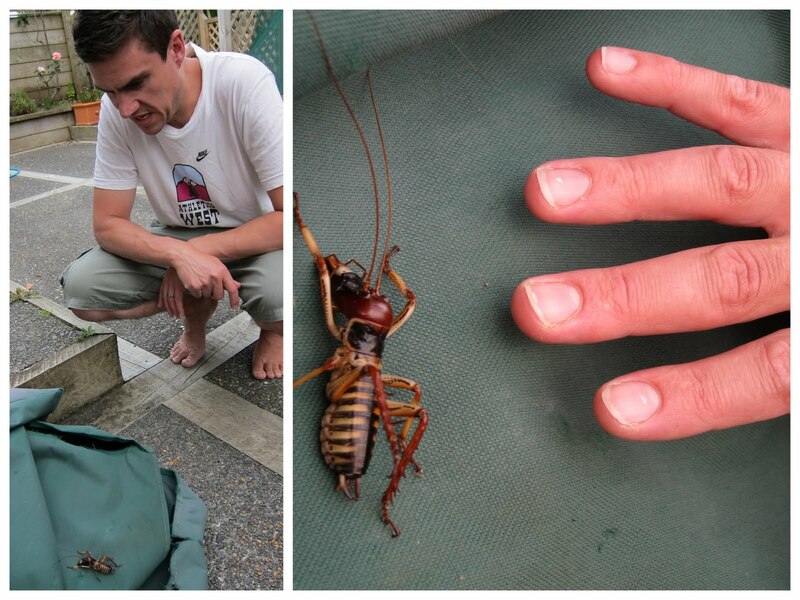 Not so keen on your weta friend! Know what you mean about getting those house 'jobs' done; been like that here, but I'm out of time now... Parents in law arrive Saturday!!! Thanks for putting together a fab poem too - you are do' multi-talented! the pohutukawa is just gorgeous. It is my favourite nZ thing.. cant wait to get home and see some. And how cool is your top!! Not so excited about creepy crawlies either... but at least in NZ they are unlikely to be dangerous.. always terrified of what will turn up in our garden here. Yep I agree, home is goood! I love pohutukawa trees!! Loving your top too. 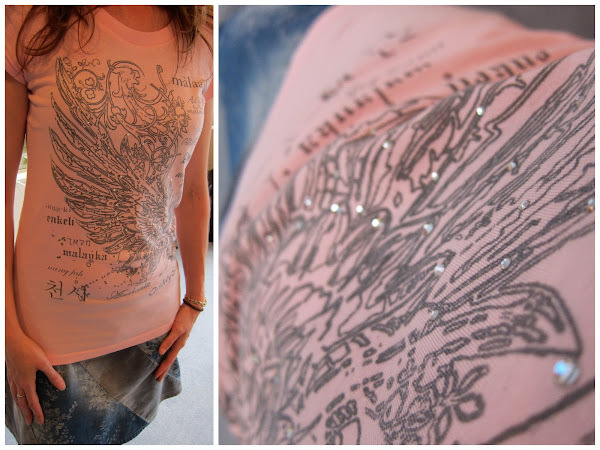 Jealous of your t-shirt - it's gorgeous! So great you got some extra family time, enjoy! Aren't wetas the ugliest things ever? !